Table of ContentsWhat is screening? Skin color and exposure to sunlight can affect the risk of developing melanoma. Melanocytes: Found in the lower part of the epidermis, these cells make melanin, the pigment that gives skin its natural color. When skin is exposed to the sun, melanocytes make more pigment, causing the skin to tan, or darken. 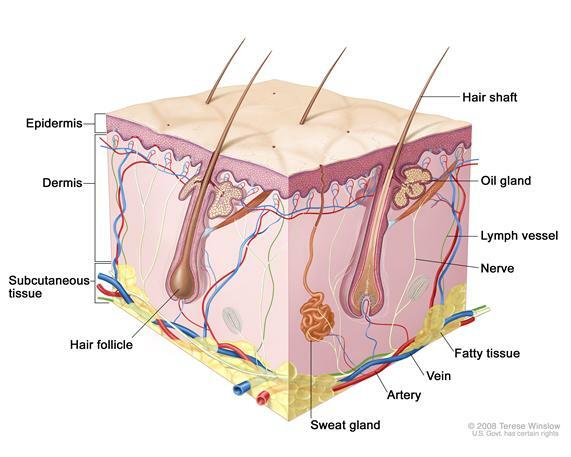 Anatomy of the skin, showing the epidermis, dermis, and subcutaneous tissue. The three most common types of skin cancer are basal cell carcinoma, squamous cell carcinoma, and melanoma. Basal cell carcinoma is the most common and melanoma is the least common skin cancer. Most basal cell and squamous cell skin cancers can be cured, but people with these types of cancer have a higher risk for developing other skin cancers. Melanoma causes about three fourths of skin cancer deaths in the United States and is the focus of this screening summary. Having a history of many blistering sunburns as a child. The best defense against skin cancer is protection from sunlight and other ultraviolet light. 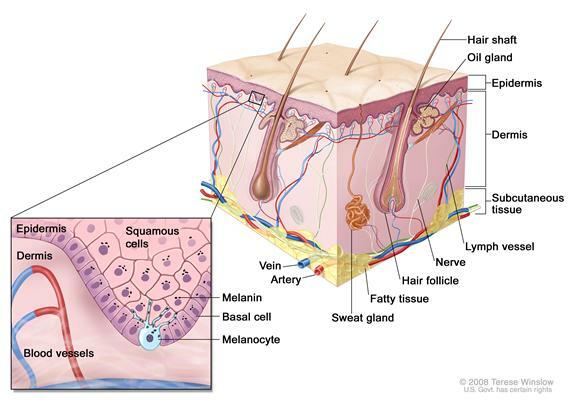 Skin examinations are commonly used to screen for melanoma. Scientists study screening tests to find those with the fewest risks and most benefits. Cancer screening trials also are meant to show whether early detection (finding cancer before it causes symptoms) decreases a person’s chance of dying from the disease. For some types of cancer, finding and treating the disease at an early stage may result in a better chance of recovery. Clinical trials that study cancer screening methods are taking place in many parts of the country. Information about ongoing clinical trials is available from the NCI Web site. Regular examination of the skin by both you and your doctor increases the chance of finding melanoma early. Most melanomas that appear in the skin can be seen by the naked eye. Usually, there is a long period of time when the tumor grows beneath the top layer of skin but does not grow into the deeper skin layers. This period of slow growth allows time for skin cancer to be found early. Skin cancer may be cured if the tumor is found before it spreads deeper. Monthly self-examination of the skin may help find changes that should be reported to a doctor. Regular skin checks by a doctor are important for people who have already had skin cancer. If an area on the skin looks abnormal, a biopsy is usually done. The doctor will remove as much of the suspicious tissue as possible with a local excision. A pathologist then looks at the tissue under a microscope to check for cancer cells. Because it is sometimes difficult to tell if a skin growth is benign (not cancer) or malignant (cancer), you may want to have the biopsy sample checked by a second pathologist. Screening clinical trials are taking place in many parts of the country. Information about ongoing clinical trials is available from the NCI Web site. Finding melanoma may not improve health or help a person live longer. A biopsy may cause scarring. Screening may not improve your health or help you live longer if you have advanced melanoma or if it has already spread to other places in your body. Screening test results may appear to be normal even though melanoma is present. A person who receives a false-negative test result (one that shows there is no cancer when there really is) may delay seeking medical care even if there are symptoms. Screening test results may appear to be abnormal even though no cancer is present. A false-positive test result (one that shows there is cancer when there really isn’t) can cause anxiety and is usually followed by more tests (such as a biopsy), which also have risks. When a skin biopsy is done, the doctor will try to leave the smallest scar possible, but there is a risk of scarring and infection. Your doctor can advise you about your risk for skin cancer and your need for screening tests.